A 4-year-old was airlifted to the hospital and a mother was injured after they were involved in a two-car collision Wednesday morning in Enumclaw, according to the Washington State Patrol. The accident occurred on Highway 169 and Southeast 383rd Street at about 9 a.m. The preliminary WSP investigation found that the mother and daughter – traveling north on 169 in an SUV – were slowed or stopped to make a left-hand turn. A dump truck was on 383rd Street waiting to turn onto the highway. Police say a Subaru, also traveling north on 169, became distracted by the dump truck and crashed into the SUV. Alcohol and drugs are not believed to be a factor in the crash, police say. The 4-year-old was in the back seat of the SUV and was found with critical injuries. The child was airlifted to Harborview Medical Center in Seattle. The mother was taken to Harborview by ambulance. Who’s At Fault In A Rear-End Accident? According to the National Highway Traffic Safety Administration, more than 40 percent of all motor vehicle accidents are rear-end accidents. That's more than 2.5 million rear-end accidents each year. Common causes of rear-end accidents? Often, one of the drivers was using a hand-held device. The NHTSA found that drivers are four times more likely to cause a rear-end crash when using a cell phone. Some other causes of rear-end crashes: tailgating (following too closely), unsafe lane changes, impaired driving, and speeding. 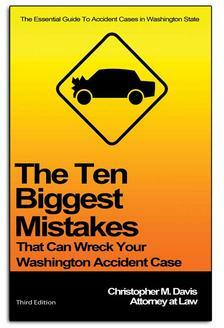 With all the factors at play in these accidents, you’re probably wondering who’s at fault. The rule of thumb in these collisions is that the person driving the back vehicle is to blame. If someone hits you from behind, it’s almost always their fault, regardless of why you stopped. If you were rear-ended while your blinker was on, it’s almost certain the other party will be found at-fault. If you would like to learn more about your legal rights after being injured in a car accident, feel free to call our office to schedule a free legal consultation. There is no obligation to meet with the personal injury attorneys at Davis Law Group, P.S., and it could help you gain a better understanding of the best course of action for you and your family. Call (206) 727-4000, use the chat feature below or fill out the contact form on this page for a free case evaluation.